At The Oaks Geography is taught through topic lessons. In Geography children find out about their local area, other areas in the UK and the rest of the world. Children gain a knowledge and understanding of places in the world and environmental changes that take place. Children engage in discussion about environmental problems and this is supported by work with, for example Chester Zoo and visiting practitioners such as Antony Lishak who explored how to make the world a better place with Year 5 and 6. 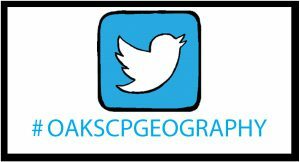 Through Geography children develop a variety of skills including enquiry, problem solving, communication and computing.